Bushido Swords for sale are available from popular manufacturers like Ten Ryu, Musashi, Hanwei and more. All of these traditional Japanese swords feature sharpened blades and include scabbards. This collection includes samurai katanas, tanto and wakizashi length pieces. Buy Bushido swords, samurai katanas and more all on sale now. Shikoto Katana Swords for sale are 43 1/8th inches in all. The full tang Shikoto, or Japanese Death Katana, features a highly polished 29 ½ inch functional blade. The 1045 carbon steel blade features a traditional blood groove and is laser etched with Japanese symbols that represent the code of the Bushido. The laser etching represents the seven virtues of the Bushido: rectitude, courage, benevolence, respect, honesty, honor and loyalty. The blade tang is stamped with the distinctive Shikoto stamp. The hardwood handle features a brown leather grip over rayskin and features a brass handle ornament or menuki. The blade collar is also crafted in brass. The polished and lacquered hardwood scabbard features matching brown accents. 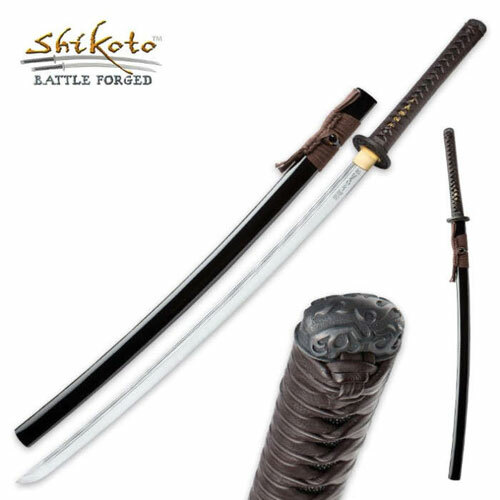 Buy the popular Shikoto Bushido Katana Swords for $159.99.